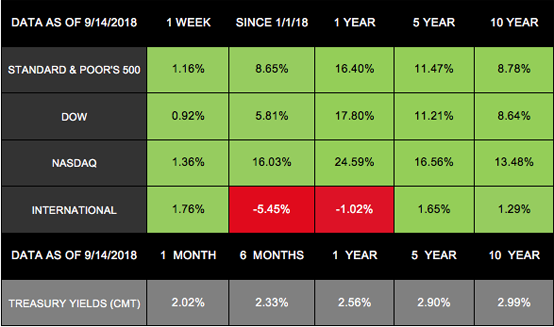 Let's examine last week's data to understand examples of where we are today: Domestic indexes rebounded to post healthy gains for the week, with the S&P 500 adding 1.16%, the Dow gaining 0.92%, and the NASDAQ increasing 1.36%. International stocks in the MSCI EAFE were also up, gaining 1.76% . Also, for those affected by the hurricane, we're ready to support your recovery and provide the financial guidance you seek . Put couscous in a bowl. Pour on juice from half an orange and 1 cup of hot tap water. Keep covered for 15 minutes. For seasoning, add salt and pepper and mix gently. At the same time, add cumin, cayenne, and salt to shrimp to season. Broil the shrimp with the asparagus mixed with oil and seasoned with salt and pepper, 2 minutes each side. Broil until shrimp is opaque throughout and asparagus is tender. After squeezing the juice from the other half of the orange on the shrimp, serve with couscous. Kicking the Sugar Habit with a Detox? Jackie Gleason may have made the phrase "How sweet it is" famous, but medical authorities are saying not so fast, especially in the form of added sugar. America's attraction to sweets may not be so healthy. Too high an intake of sugar may lead to a variety of ailments, such as heart disease, diabetes, and obesity. How about the trendy sugar detox? Will it help you break the habit? Let's explore the sweet facts. It's true that some people crave sugar and use it in excess. But is it an addiction? Probably not. Is it unhealthy at high levels? Definitely. Your body then works to remove the glucose from your blood. Your pancreas produces insulin. Your blood sugar then plunges, which produces sluggishness and the desire for more sugar to reacquire that sugar high. That leads to more eating. And more eating, naturally, tends to lead to obesity and other weight problems. Health experts recommend retraining your taste buds by initially eliminating one sugary item at a time. You may explore other "sweet" or healthy options such as berries or low-sugar yogurt. Quitting or controlling the sugar habit may be a struggle at first, but you reap plenty of benefits: a healthier lifestyle, more energy, and weight loss . Use cool water while rinsing. Washing and rinsing with hot water uses more than three times the energy than using cool water during rinsing. The newer, more efficient washers use nearly four times less energy than the older machines. You can also save up to $70 a year in energy costs. Lower your water heater's temperature to 120ºF, which is sufficient for most of your laundry. Do one big load rather than several smaller ones. But don't overload your washer either. Clean your dryer's outside vents regularly. Take your clothes out of the dryer slightly damp and hang them up. This reduces the need for ironing.